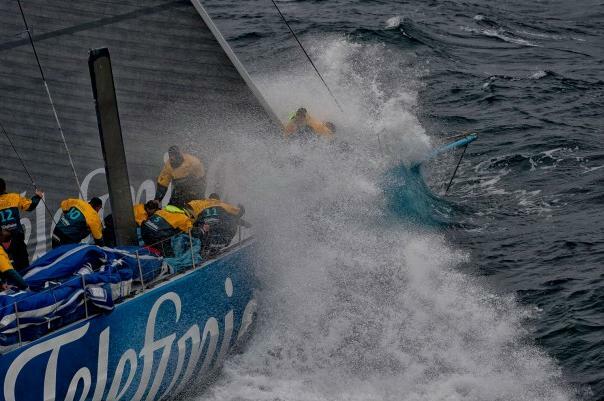 After a brutal first 36 hours of strong headwinds and pounding waves Telefonica lead leg five of the Volvo Ocean race from Auckland to Brazil with Team New Zealand entry Camper in second. Overall race leaders Telefónica have a 14 nautical mile advantage over the New Zealanders with Groupama third a further 14 nm back. Puma is in fourth with Sanya fifth ahead of Abu Dhabi who re-joined the race after having to return to Auckland to repair boat damage. Overnight satellite images revealed possible iceberg ‘targets’ outside the exclusion zone and accordingly shifted a waypoint north. This altered the distance to finish calculation for the fleet but did not affect the leg standings.